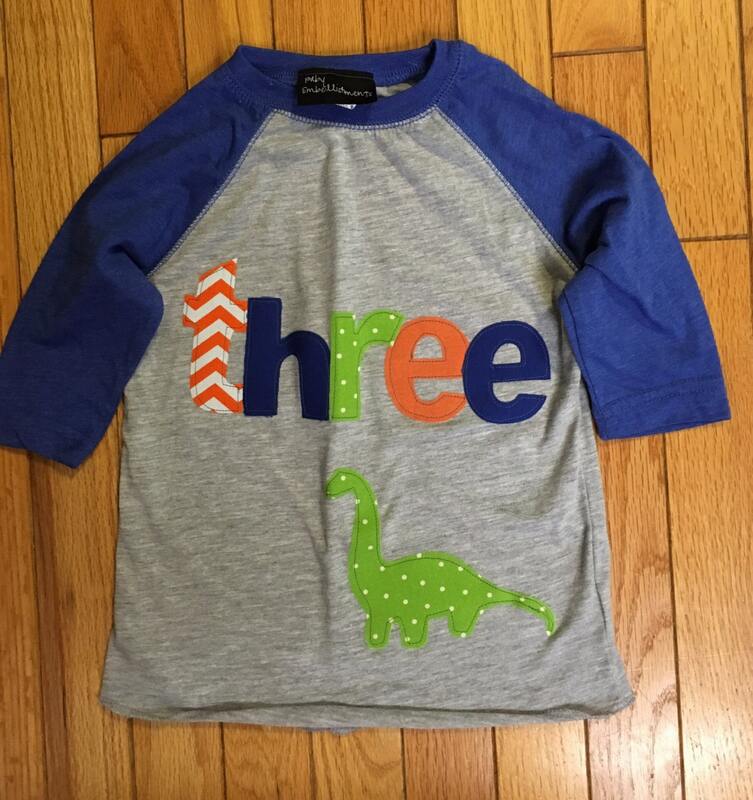 Three appliqué with matching dinosaur, perfect for your little archeologist's third birthday celebration. I understand that sizing is different for all brands. I wash and dry all shirts before applique process. I use Rabbit Skins, Old Navy and Granamals brands. Here are measurements based on sizes listed give or take 1 cm. Please read and measure a shirt of your childs to ensure correct sizing before ordering as returns are not available and exchanges must be pd shipping both ways by purchaser. Sizing charts are part of listing descriptions. Free of charge. Please add a note to seller when ordering. Yes we love custom orders. If you request one please watch your email for responses promptly to keep your order moving along. What is the typical production and shipping time? Typical production time is 10-14days. To decrease production time purchase the rush listing along with the desired listing. 2 Shipping options are also availability but these DO NOT change production time. Shipping options are 2-3 day priority and 3-5day standard. I use USPS and drop packaged at the post office at 930am and 430 pm for daily shipping. I provide tracking numbers on all orders. Adorable! Thank you so much, it was perfect!